​Below are news articles from the latest newsletter (April 2018). If you need the newsletter in its entirety, please contact Newsletter Editor Teri Wilson. Program: Ron Seigla. "Talk to Your Pharmacist". Ronald Seigla will speak about the importance of talking to your pharmacist about your prescriptions. He will touch on e-scripting, vaporizing, cannabis-derived drugs and the correct way to take medications. Chairperson for the day: Judy Mack and Reception Table Hostess: Micki Curtner. Hospitality Committee: Tea Cookies by Arts and Crafts; leaders Sandy Mefford and Linda Parker. Tea Table Decor: Dr. Shirley Stallworth; Pouring coffee / tea: Past Presidents Denise Hedley and Ann Wolf. Cookie bakers from Arts and Crafts: Terrie Koss, Jean Mahan, Judy Mayer, and Karen Weglage. Additional bakers are: Sandy Mefford, Doramae O'Kelley and Pat Mendenhall Smith. Please remember to make your checks payable to The College Women’s Club (CWC) and have them received by Monday, March 26. From the CWC President (Dr. Shirley Stallworth): Hello CWC Members !!!! Join me in welcoming in the month of April! We are more than familiar with the saying “April showers bring May flowers”, however, you may feel as I do coming out of the horrendous winter we endured. I do not want to experience any showers whether they be rain showers or snow showers. We applaud all gardeners during this month as this is where your journey of sowing seeds and reaping beautiful flower gardens begins. The name April is rooted in the Latin Aprilis which is derived from the Latin meaning “to open” – which could be a reference to the opening or blossoming of flowers and trees, a common occurrence throughout this month in the Northern hemisphere. Mark Twain once wrote: “This is the day upon which we are reminded of what we are on the other 364 days of the year.” He, of course, was speaking of “April Fools” day. I hope you do not find yourself succumbing to this yearly trap and I know we all have stories to tell. The month of April goes way back to King Numa Pompilius (second king of Rome) around 700 BC; before January and February were added to the year, April was already the second month. In 450 BC, April was rearranged into the fourth slot. Some April events and holidays include: National Volunteer Month, National Poetry Month, National Mathematics Education Month, National Autism Awareness Month, and this year, Easter celebration – Sunday April 1 and this is no April fool joke! I was asked to form a committee to update and “to clean up” the current Constitution. The Constitution committee was Judy Mack, Pat Torvik, Karen Weglage, Sue White and I, Chairperson. We met many times during February. Deletions, addition of new sections, capitalization, proper names/titles, clarification and punctuation were accomplished. The amended Constitution will be sent separately using the newsletter email data base. The Constitution will NOT be part of this newsletter and will be sent before the April 2nd general meeting. If you do not receive your newsletter via email, you may contact Jean Short, 439-1353. She will send a hard copy of the amended Constitution to you via USPS. The amended Constitution will be presented at the April 2nd general meeting. The amendments will be identified at this time. The membership will vote at the May 7th general meeting. EDITOR'S NOTE: Click HERE to read a copy of the proposed Constitution. CWC Board Meeting: The board meeting will be held on April 2 at 10:30 a.m. at the Dayton Woman's Club. May Newsletter Deadline: Tuesday, April 3 to Teri Wilson by either email or snail mail. Teri's contact information is in the yearbook. Study Groups: Please refer to your yearbook for date, time and place, and additional information about each study group. If you would like to attend as a guest or join the group, please call the leader. Book Group — Leader: Malou Hurst. April 23 at 1:00. Reviewer Sandy Mefford. Hostesses: Marilyn Rinehart, Marsha Tolle, Marge Weeks. Interior Design Group — Leader: Marsha Tolle. Program: Tour of Downtown Dayton Librayr. Lunch: TBA. Hostess: Sandy Mefford. Gourmet North Group -- Leader: Susan Buckles. April 12 at 12:15 pm. Hostess: Marianne Shoemaker Co-Hostesses: Anneliese DiGiacomo and Donna Zobrist. Book Review by Malou Hurst: “Killers of the Flower Moon” by David Grann is the true story of robbery and murder that occurred in the 1920's. At this time, members of the Osage Indian nation were among the wealthiest people in the world. Oil had been discovered under their land; where there was money came deceit and thievery. One by one, the Osage began to be murdered. As the count rose the new FBI under the direction of J. Edgar Hoover took over the investigation, but eventually called on a former Texas Ranger to help solve the crimes. The book is well re-searched and thought provoking. It's a good read when you are tired of fictional mysteries, complete with sinister secrets and surprise revelations! Enjoy! I am by nature a very detailed person and thoroughly enjoy my position as Assistant Treasurer. In the two years I have held this position, I have tried to be very accommodating in receiving late luncheon reservations. However, the number of members who send late reservations keeps increasing. I must coordinate the number of reservations with DWC so that the chef has ample time to purchase sufficient food and the staff sets the appropriate number of tables. I also deposit all the money I receive prior to our meeting date and must ensure that everything balances. 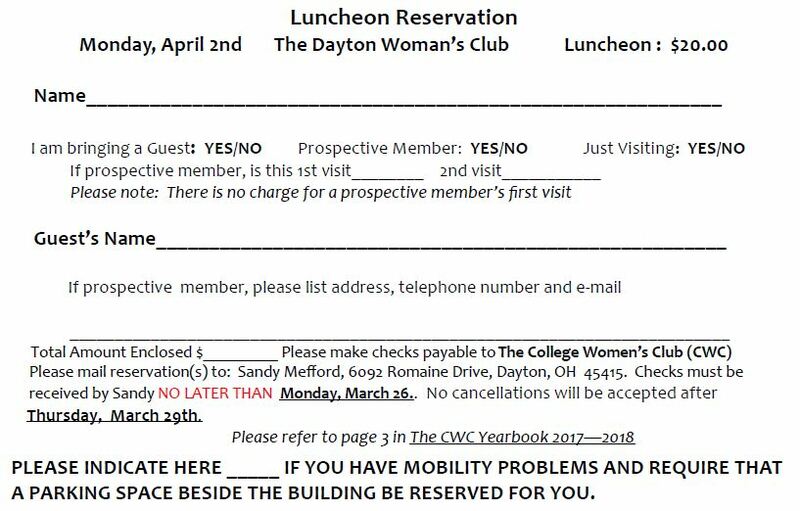 The Luncheon Reservation form for the CWC April 2018 Luncheon is provided below. Weather Announcement: If the Dayton City Schools are closed for inclement weather, then the DWC will also be closed. Therefore, scheduled CWC events will be cancelled.